3D printing stocks have had a rough couple of years, but Proto Labs has outperformed its competitors by focusing on engineering customers. The last three years has been rough for the 3D-printing industry. 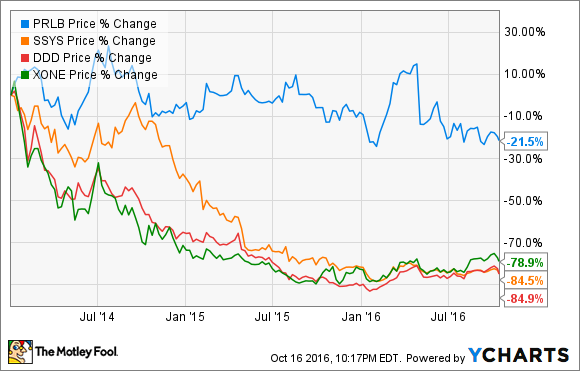 Stratasys (NASDAQ:SSYS), 3D Systems (NYSE:DDD), and ExOne (NASDAQ:XONE) have all fallen far in the last three years. The industry didn't grow as planned, so all three are still losing money right now. But one company, Proto Labs (NYSE:PRLB) has been spared the worst of the pain and is actually profitable. Understanding why is a good lesson for investors. When 3D printers burst on the public scene a few years ago, they were touted as a way to revolutionize manufacturing. Any part could be printed in a short amount of time, making custom manufacturing a relatively easy task, something many thought a lot of companies would take advantage of. Never mind that 3D printing wasn't new at all and had been around for decades. Investors saw that 3D printers were becoming smaller and materials were getting better, so the possibilities were endless. Eventually, 3D printing moved from specialized labs and manufacturing shops to desktops as 3D Systems and Stratasys both made products that could be put on a desk in the home. The technology was becoming ubiquitous, but for one small problem. The missing link was that relatively few people knew how to design parts on computer-aided drafting programs, making the home market extremely difficult to break. And mass manufacturers have little incentive to put the engineering time and money into building custom parts for most products. 3D printing was ready to take off, but no one was there to pilot the plane. What made Proto Labs different is that it wasn't reliant on customers buying equipment and then refilling material over and over again. The equipment business can be fickle with competitors coming out with new products and consumer demand still an unknown. Proto Labs took a different approach, serving the engineers who design parts that 3D printers make. But there's more flexibility with Proto Labs than a single 3D printer, offering more materials and even short production runs. In my personal experience as an engineer who printed hundreds of 3D parts, the end goal was always a production run. So it was valuable to have the path to production in mind. Serving customers that already had the CAD training necessary to utilize 3D printing and rapid prototyping has been a key for Proto Labs. That eased a major pain point 3D printing companies felt and created a better value case for customers. 3D printing is still a really big deal in the product design world, it just didn't become as ubiquitous as 3D printer companies hoped it would be a few years ago. But Proto Labs has been able to carve out a niche, serving customers who need a quick turnaround and high-quality products for prototyping or small production runs. And it doesn't have to train customers on how to use its software. That's a big advantage to have in the market and makes Proto Labs the kind of company that's built to last. The 3D printing revolution may not have worked out as some companies planned, but Proto Labs is taking advantage of the market's needs in a big way. Editor's note: A previous version of this article stated that ExOne made a desktop printer. The Fool regrets the error.